It’s easy to fall in love with goodies from Manzanita Kids, a wonderful handmade Etsy shop, especially when owls and the galaxy are involved. This beautiful puzzle combines three sweet little owls and the evening sky to create a winning puzzle combination. Hand cut from walnut and finished with homemade local beeswax/jojoba oil, this puzzle measures 5 1/2 inches x 8 1/2 inches. All pieces are sanded smooth with rounded edges, making it safe for little hands. Beyond adorable, this puzzle, like all puzzles, will help your child develop confidence, spatial reasoning and fine motor skills while playing. Your child’s puzzle will come wrapped in brown craft paper, sealed with a Manzanita Kids sticker. The company uses all biodegradable packing material and/or recyclable newspaper to protect the puzzle during shipping. It's easy to fall in love with goodies from Manzanita Kids, a wonderful handmade Etsy shop, especially when owls and the galaxy are involved. This beautiful puzzle combines three sweet little owls and the evening sky to create a winning puzzle combination. Hand cut from walnut and finished with homemade local beeswax/jojoba oil, this puzzle measures 5 1/2 inches x 8 1/2 inches. 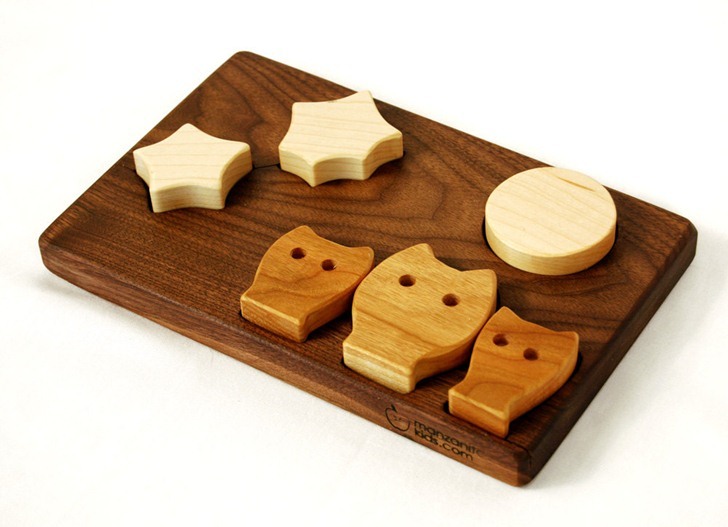 All pieces are sanded smooth with rounded edges, making it safe for little hands. Beyond adorable, this puzzle, like all puzzles, will help your child develop confidence, spatial reasoning and fine motor skills while playing. Your child's puzzle will come wrapped in brown craft paper, sealed with a Manzanita Kids sticker. The company uses all biodegradable packing material and/or recyclable newspaper to protect the puzzle during shipping.